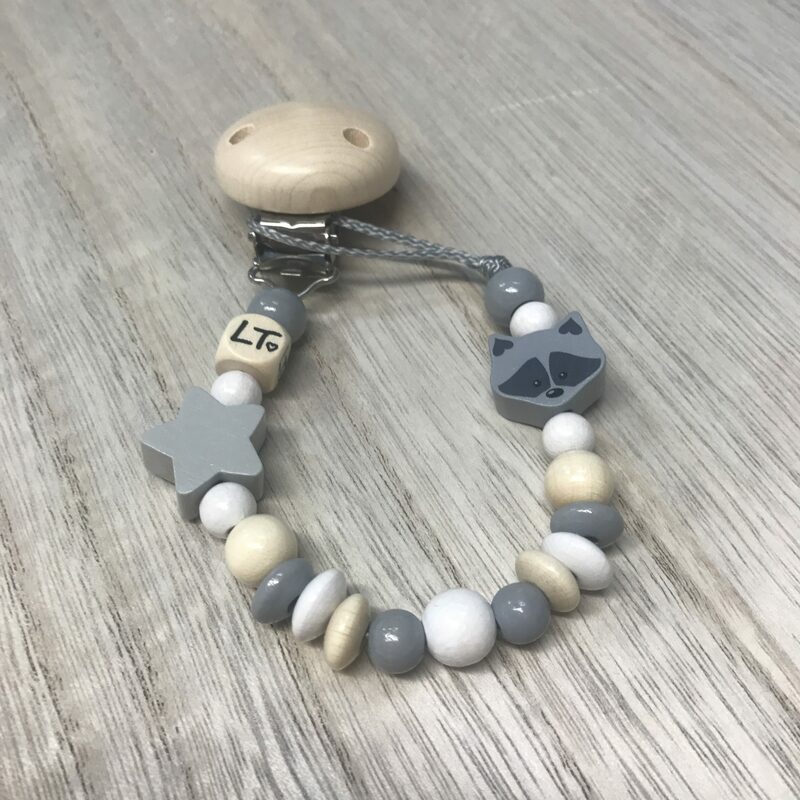 The Luna Treasures Grey Star and Reginald Bandit Soother Chain is a beautiful raw soother chains with grey stars & a raccoon ‘Reginald Bandit’. All these chains feature the new raw clips. Due to stringent guidelines on the properties of materials used for soother chains and grasp toys these are cosmetically delicate items as cosmetic longevity of paints and prints and non toxicity are rarely achievable given the many restrictions. 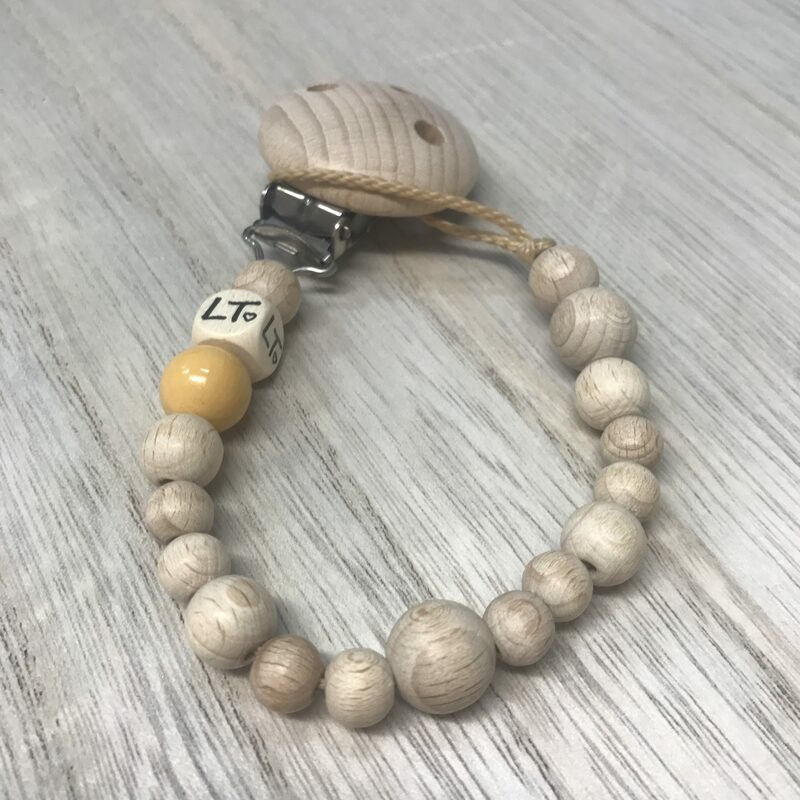 Products are made from natural materials and as with other wooden articles the materials used might darken / fade over time, prints might start to rub off and/or show other signs of use which do not affect the safety or continued use of your product and does not represent a faulty product. Naturally babys will put things in their mouths and chew or lick on things. Adults are responsible for supervision at all times and remove the product from the babys mouth if this occurs. The impact of saliva will soften the wood over time and chewing will contribute to abrasion or possibly chipping of the coating. Any of this “wear & tear” will not decrease the safety of the product however the products are not suitable teethers. All natural coloured beads, clips and plain natural motif beads show the least cosmetic wear. Contact with fluids including water, juices, teas, milk, babys vomit and saliva etc. Physical contact : touching, rubbing, cleaning etc..
A general guide is for babys 6 months and under its longer lasting due to limited grasping skills and mobility as well as food varitety given – given the above mentioned exposure to accelerants is small. Please only attach to thin materials (baby’s onesie, shirt). 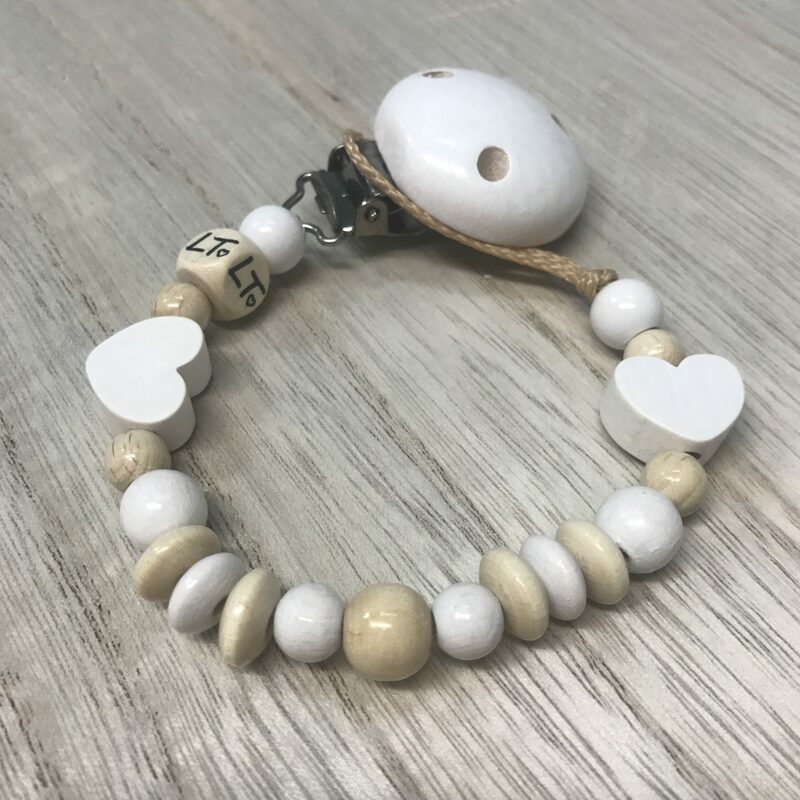 All beads (except acrylic letters) are natural materials and it is possible that they can crack due to hairline fractures (although this is quite rare) – if this occurs please contact me immediately with a photo and do not use the item. Expect approximately 6 months of use out of each item – as above mentioned cosmetic wear and tear can start within weeks of use. Please follow care instructions provided on your packaging (keep packaging for the duration of use). Please only very gently wipe your items with a very damp soft cloth with luke warm water only. All the materials are european made and are of premium quality. I don’t alter any of my materials however I am closely involved in the design process of the feature motif beads and always busy behind the scenes designing new ones that are eventually released months and months later. I lovingly design and hand make all of your items (mostly to order) and work out of my home studio. My husband helps me with packaging and posting your items but otherwise Luna’s Treasures is a one mama business at current. It is the home of quality wooden baby and kids goods lovingly handmade in Australia. 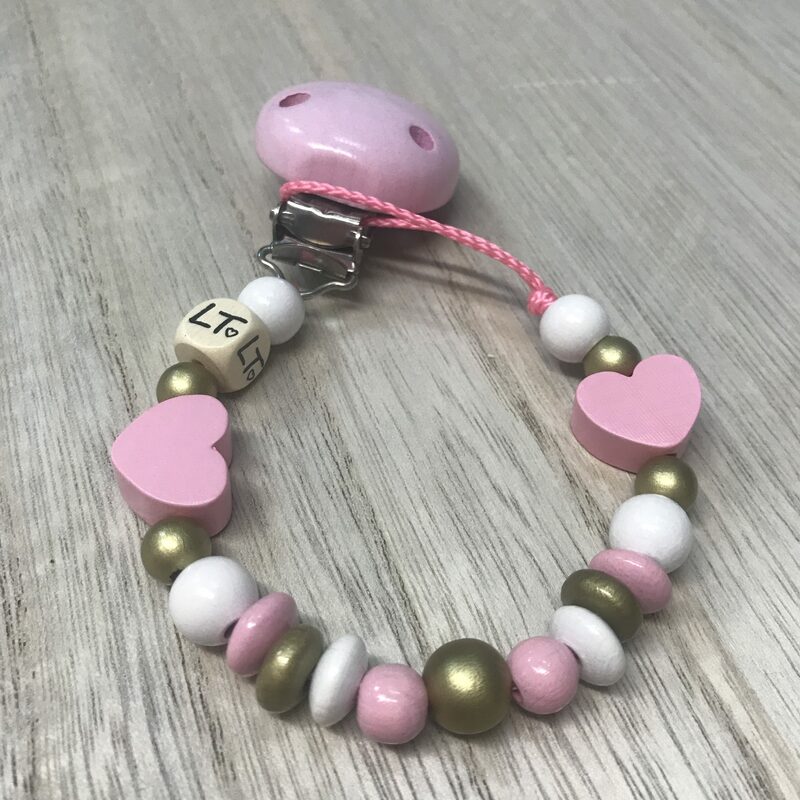 Products offered include baby soother chains and grasp rings as well as bag tags. 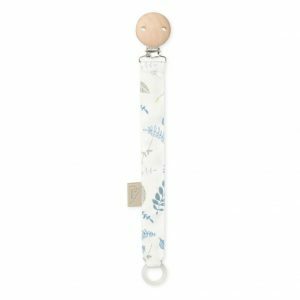 In addition there are natural rubber soothers & teethers and wooden rattles available to purchase.